Might Live In Freedom World War I Kozlik, Henry · Stevens, Giles F. · Hilliard, Howard G. World War II Burnes, Edward J. · Jones, Richard H. · Malchiodi, Peter B. · Morgan, Harry C. · Burnham, Bruce B. · Burnham, Ernest C. · Burnham, Robert M. Vietnam War Andrews, Thomas D. · Fleet, Stephen M. Korean War Cookson, Frederick E. Jr.
( left front panel ) World War I Allen, Daniel · Anderson, George E. · Bliss, Frank D. · Bradt, Delancy · Buell, Melvin W. · Burnham, David E. · Burnham, George A. · Carpenter, August G. · Chalker, James H. · Cianciolo, Antonio S. · Crum, Clifford H. · Duelle, Katherine P. · Finer, Sidney A.R. · Foerch, Ernest A. · Foerch, Harold E. · Funk, William J. · Gaylord, Levi S. · Hauck, Allie K. · Hauck, Arthur K. · Higgins, Austin D. · Higgins, Edward E. · Higgins, Philip W. · Holtz, Raymond B. · Hull, Seward F.
· Doane, Raymond H. Jr. · Dolanski, Sigmund · Donzello, Anthony · Eliot, John L. Jr. · Emack, Warren · Emery, Edmund · Fassbinder, Frank · Fenn, Frank · Fettig, Bruce A. · Fletcher, Howard M. · Foerch, Donald · Foerch, Harold E. Jr. · Foerch, Joseph H. Jr. · Foerch, Lloyd · Foerch, Norman · Fosque, William J. · French, Arthur L. · Funk, Edward W. · Funk, Henry C. · Funk, Richard · Gay, Robert · Gaylord, Kenneth H. · George, Eugene E. · Gesick, Frank S. · Glynn, Robert L. · Goodwin, Malcolm · Gould, Winfred E. · Graf, Fred · Griffin, Charles · Griffin, Harry E. · Griffin, Winfred R. Jr. · Gustafson, Theodore · Guston, Carl H. · Guston, Oscar A. · Guston, Richard · Habisreittinger, Frank · Hall, Kenneth · Hall, Matthew · Hall, Richard C. · Hallowell, Joseph H. · Hancock, Harris S. · Hatch, George · Heser, Charles O. · Heser, Harold E. · Heser, Robert · Hill, Fannie · Hoadley, Randall · Holmes, James G.
Korean Veterans Anderson, Ronald R. · Austin, Morris E. Jr. · Avery, Louis B. · Brainard, Oliver D. · Bell, Hamlin · Beringer, Ralph · Beringer, George · Breiling, Harold F. Jr. · Brown, Gustave Jr. · Bugg, Bernard · Carter, Norman H. · Champion, Lawrence · Correll, Lee G. · Dallas, William H. · Dahlberg, Charles F. · Evarts, Rogers R. · Foerch, Donald · Foerch, Joseph H. Jr. · Gasparine, Clifford · Graef, John H. Jr. · Griffin, Roger D. · Gustafson, Donald W. · Hamilton, Robert E. · Heser, Donald E. · Hull, Pierce J. · Jennings, Arthur · Kane, Francis E. · Kissam, William P. · Levasseur, Robert · Martin, James Jr. · Matus, Thomas Harry · Neri, John L. · Neri, Joseph · Neri, Seldon S. · O’Brien, Edward J. · Orsina, Richard C. · Platts, George C. · Richter, Ralph W. · Rollar, George · Ryerson, Alvah W. · Ryman, David A. · Shreiber, Andrew K. · Schrempp, Frank J. · Scott, Donald H. · Schubert, Arthur C. · Schubert, John · Siewart, Irving H. Jr. · Smith, Freeman R. Jr. · Spinning, John N. · Vece, Gerald J. · Walden, Milton A. Jr. · Walton, Richard T. · Ward, John P. · Ward, William A. III · Watrous, George K. · Weisse, Fred G. · Wellman, Harry D. Jr. · Wilson, John H. · Woodstock, Robert W. · Wright, Harold S. · York, Robert Jr.
World War II Burnham, Bruce B. · Burnham, Ernest C. · Burnham, Robert M.
Location. 41° 16.671′ N, 72° 31.41′ W. Marker is in Clinton, Connecticut, in Middlesex County. Marker is at the intersection of East Main Street (U.S. 1) and Cemetery Road, on the right when traveling east on East Main Street. Touch for map. 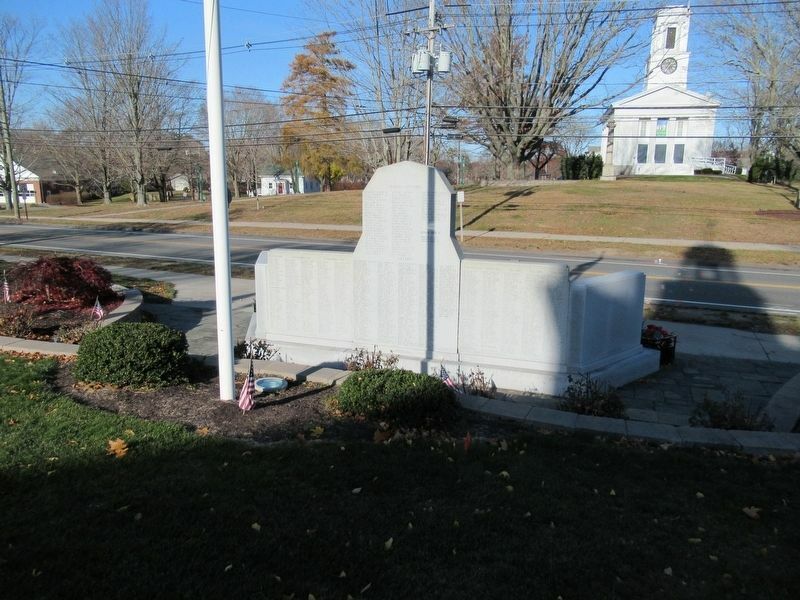 Located in front of Clinton Town Hall. Marker is at or near this postal address: 54 East Main Street, Clinton CT 06413, United States of America. Touch for directions. Other nearby markers. At least 8 other markers are within walking distance of this marker. Clinton (within shouting distance of this marker); Field of Flags (within shouting distance of this marker); Yale College (within shouting distance of this marker); A Seafaring Town (about 300 feet away, measured in a direct line); Charles Morgan (about 700 feet away); Abraham Pierson (about 700 feet away); This Cannon (approx. 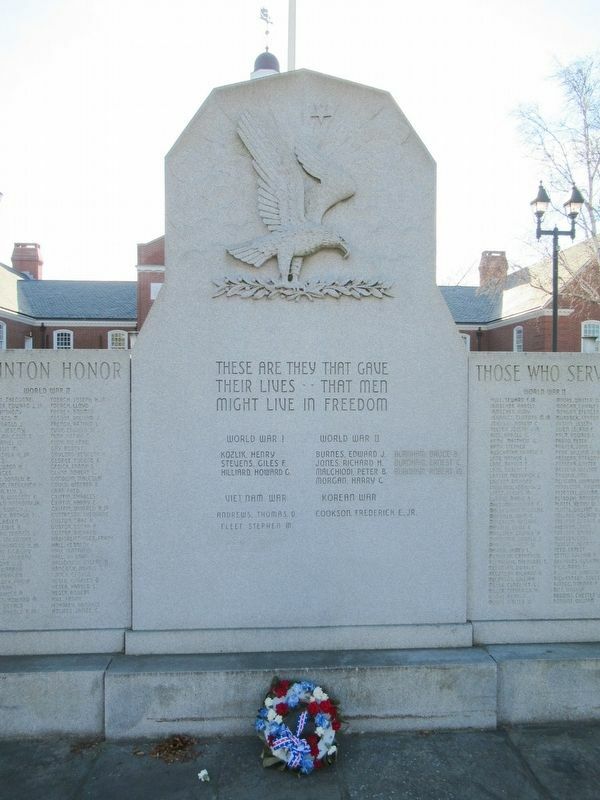 0.3 miles away); Clinton Soldiers Monument (approx. 0.3 miles away). Touch for a list and map of all markers in Clinton. More. 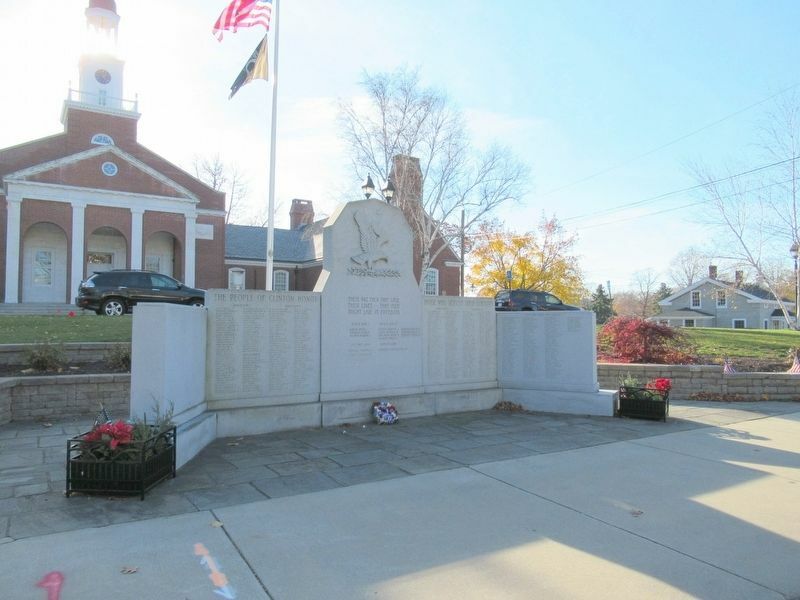 Search the internet for Clinton Veterans Monument. Credits. This page was last revised on December 3, 2016. This page originally submitted on December 3, 2016, by Michael Herrick of Southbury, Connecticut. This page has been viewed 574 times since then and 29 times this year. Photos: 1, 2, 3. submitted on December 3, 2016, by Michael Herrick of Southbury, Connecticut.